Now when the automatic Review Reminder email is sent to your clients, it will be logged in the Activity Log. We’ve added new navigation buttons on the album viewer. Now your client can navigate directly to the first or last spread on the album. Sometimes the album may be approved by mistake and you want to move it back to the Awaiting Client column. Or it’s in the Requests column and you want to open it for a new revision round. Now it’s really simple! You can do it without having to resend the album to your client. 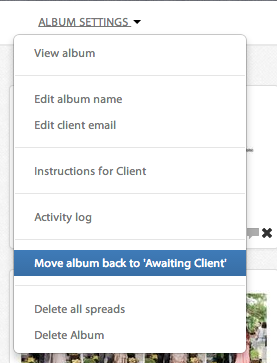 Simply go to ALBUM SETTINGS > Move album back to ‘Awaiting Client’. When printing the requests page, the comment markers had a transparent background, making it very hard to be seen. Now it has a white background and is much more visible. Don’t forget: We work hard to make Albumdraft perfect for YOU. So, if you have ideas or suggestions, please do get in touch! You can email us at: support@albumdraft.com, facebook or twitter @albumdraft. ← Do you know you can automatically insert the album name in the emails?